Posted on September 19, 2012	by Pat Donworth, D.Min. I walked by the New Release table at the bookstore where I worked back in the spring of 2001. Like a bee to honey, my eyes went straight to a hardcover book displayed prominently in the center of the table. The blue and white cover, with a graphic of stars and deep space, and Michelangelo’s “The Creation of Adam” – God’s hand reaching out to Adam’s outstretched fingers – caught my attention. Hmm… The Reconnection: Heal Others, Heal Yourself by Dr. Eric Pearl. I picked up the book and – I kid you not – I immediately felt a vibration or tingling in my fingers and palms of my hands. Trust me, that’s not the usual reaction I get when I pick up a book. I thought, “Whoa, is it me or is it the book?” I leafed through it and the tingling sensations – like a low grade electrical vibration — got stronger, and moved to my wrists and a few inches up my arms. The book now had my full attention. I replaced it with another copy, then took the book back to my office. I skimmed through the book, to get an idea what it was about. Dr. Eric Pearl. Chiropractor. New and different energies. What you are doing is reconnecting strands. Receive don’t send. “Find it. Feel it. Stretch it.” Reconnective Healing. Okay, no wonder I was drawn to the book. I’d been interested in healing my whole life, beginning as a child, when I’d intuitively put my hands around my little brother’s turned ankle, and in a matter of moments, it was “all better” (said he) as he ran back to his kickball game. My interests had always been in “spiritual healing” and Eric’s book seemed to follow along those lines. More interesting, though, this tingling sensation returned, in and around both hands. It was a pleasant feeling, like wearing a pair of electric gloves. I felt the electric or vibrating sensation inside my hands, but also all around my fingers, palms, and the tops of my hands. Perhaps the strongest sensations were in the fleshy part, or heel of both hands. “How interesting is this,” I thought to myself. Just then I was paged to the front, where my first grade class from a local school had arrived for their “field trip” to the bookstore. Duty called. I put Eric’s book aside and went up front. I am in a circle of healing brothers and sisters. They are human, but don’t live on Earth (what I would now call extraterrestrial humans). There are 11 or 12 of us; it is night time and we are sitting in a circle. A young man walks into the circle. The members of the circle look at me and tell me that he is seeking healing. One of the group members tells me that all the circle members make up a “healing group”, but that since I am presently in an Earth incarnation and the man seeking help is from Earth, that I will facilitate the healing in a visible way, while the group is with me (as invisible helpers). I had this dream the following two nights as well. 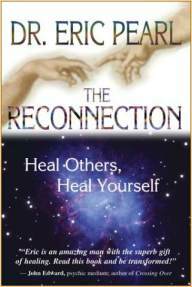 For the past 11 years, as I have facilitated Reconnections and Reconnective Healing sessions, this circle of Reconnective Healing friends has been with me. I know it may sound strange, but it is what it is. To contact Pat, click here.